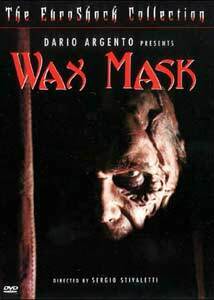 The Wax Mask began life as a project that Italian horror legend Lucio Fulci was originally to have directed. Fulci collaborated with director Dario Argento on an update of the Gaston Leroux story which, in and of itself, had spawned a few other movies. Fulci's death in 1996 put a damper on the project and, at one point, Argento himself was to have directed the film until he decided he'd rather direct his new version of Phantom of the Opera. The director's chair was filled by Sergio Stivaletti, a popular Italian special effects artist who had worked on many popular horror projects. The end result is an Italian horror film that might be flawed, but certainly marks a hopeful high point in the genre as one of the best films to come from the region in a long time. In the story, a young couple is murdered in Paris in the year 1900 by a strange, cloaked man with a steel hand. The daughter of this couple, Sonia (Romina Mondello) not only escapes being killed but witness the whole thing. 15-20 years later in Rome, Sonia is trying to get a job as a costume designer for a new wax museum. The museum has not opened yet, but has already generated a stir in the community because of the rumored incredible realism the wax figures represent. The mysterious curator of this museum, Boris Volkoff (Robert Hossien), is extremely protective of his work and lives a strange life. The museum is staffed with an unusual collection of people and all the wax pieces are reenactments of extremely violent acts. A local journalist becomes romantically involved with Sonia, while also covering the opening of the museum, but he begins to suspect a connection between Volkoff and the murders Sonia was involved with in 1900. Meanwhile, the mysterious, steel- handed killer is still at large in Rome. All of this mystery eventually combines into one, solid plot about the secret horrors of the wax museum. As a period horror film, Wax Mask bursts with style and wonderful cinematography. Added to this is the tight direction on the part of Stivaletti; his education under the hand of filmmakers like Dario Argento and Michele Soavi is plainly evident. While the film has a lot of sexuality in it, it never gets so extreme that it breaks the character of the film with tons of sleaze. This all results in the extremely effective creation of a believable environment. The subject matter occasionally departs into wild fantasy, but it does so in a way that adds to the film, rather than making you laugh unintentionally. Wax Mask does have it share of flaws, mainly in the form of the convoluted mystery plot that takes too long to wrap up. There's also an unexplained aspect to the film where the steel-handed killer often kills people for no discernible reason, whereas other times for specific purposes. Regardless, the film is a wonderful throwback to how wild and bizarre Italian horror cinema used to be in the 80's. What enhances the experience most, is the impressive special effects by Sergio Stivaletti. The film features elaborate gore/make-up work and, more importantly, some puppetry and animatronic work that's pretty good considering the average technology used in these films. Image Transfer Review: Image Entertainment delivers another stellar disc, visually speaking. The rich cinematography is accurately produced with fantastic clarity. Colors are bright and lively, evenly offset by good black level with no pixelization. Much of the film is pretty dark, so this is certainly a good thing. Diffusion and fog filters were used in certain scenes, but this has produced no digital artifacts or pixel shimmer. Even at full-zoom, no signs of compression problems are evident and nothing feels "artificial" in the transfer, like edge enhancement or anything similar. The source print has a few minor defects, mostly during reel changes, but otherwise is in surprisingly fine shape. The 1:78:1 aspect ratio presented here seems to be gaining popularity as the most common aspect ratio in European film (presumably because of the large population of HDTV users). Audio Transfer Review: The Dolby 2.0 Surround audio is amazingly lively and clear overall. The front channels carry most of the audio, with the music score and certain sound effects making their way into the surrounds. Dialogue is well balanced with the rest of the film, and almost every scene has a very wide frequency range, creating an immersive mix. There isn't much directionality or specific channel usage given that this is mainly a dialogue driven film, but whenever the more elaborate special effects kick in the audio matches it well. Unfortunately, the dubbing is HORRIBLE, as in: very, VERY painful. Originally filmed in Italian, I would have killed for an original soundtrack because of the bad voice acting and lip-sync problems. This is certainly one of the worst dubs I've ever heard, I'm sad to say, but I won't take it out on the soundtrack itself. Behind the scenes photo gallery. Extras Review: A very short photo gallery is the sole extra here. The photos are mildly interesting (including a picture of Dario Argento and Sergio Stivaletti on set), but don't really add up to much. Otherwise, there's nothing else. Something a bit more meaty would have been nice, especially since this is Stivaletti's first directorial effort. More chapter stops are definitely needed as well. Let's face it, Italian horror cinema has been pretty darn weak in the last 5-8 years. Most vetrans of the genre have either been dying off, or making questionable material that very few people seem to genuinely like. The Wax Mask might just be the first sign of a new age of Italian filmmaking. It's not a masterpiece by any stretch, but it's filled with an undeniable spirit and style. Recommended.